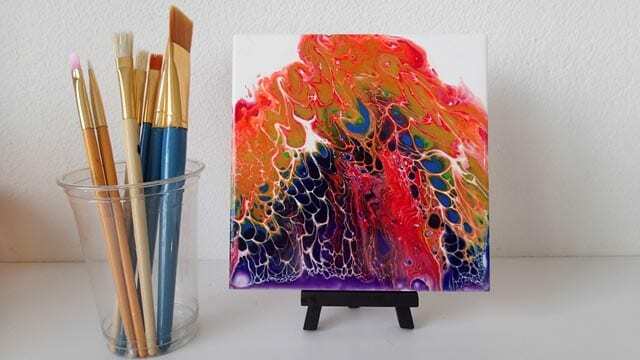 The last pour and swipe that I did on a tile, I was using up old left over paint colors and just casually mentioned that it was a rainbow of colors. Hmm, that got me to thinking. Maybe I should actually make a rainbow. I’m working on a 6 inch glossy white tile again today and I’ll add stripes of color in red, orange, yellow, green, blue, indigo and then violet at the bottom. I try to create a sort of arc of color but because I’m swiping it’s really not too important to get any kind of an accurate shape. Then I swipe – and wow! It’s certainly not a rainbow but it is absolutely glorious! There’s enough paint that I can actually tilt it a little too to move the cells and shapes to create an even more interesting composition and move the shapes over the edge of the tile. I love it when the pattern continues over the edge. Now I know I say this all the time, almost every time I complete another successful pour – but this one really is my favorite so far. The shapes and colors, well I think they are amazing. I’ve got to give this another try one day. 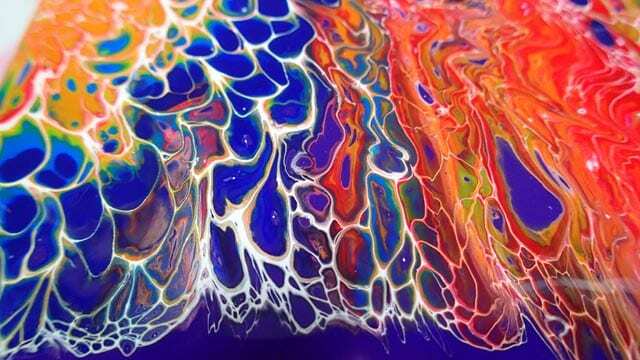 Of course it will never, ever, ever come out the same even if I did it 100 times, but I can certainly recommend pouring a rainbow next time you have some paints to use up. Check out the slideshow below for wet and dry pictures and close ups of the details. How do you prepare and then seal a tile. In my mind i think the paint would very easily peel off. What do hohh mix your paint with? Your worm is stunning. I usually just paint straight on the tile because they are only usually for my fun experiments. But you could prep them with a gesso before pouring. I’ve never had trouble with paint coming away. 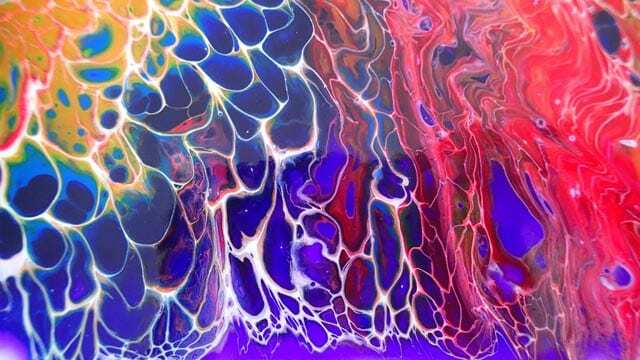 I’m still trying out all sorts of different additives and formulas so I can’t tell you a magic recipe (yet) that is going to work, but keep watching for some more videos with all my testing of new pouring mediums etc. And thank you for the kind comment. 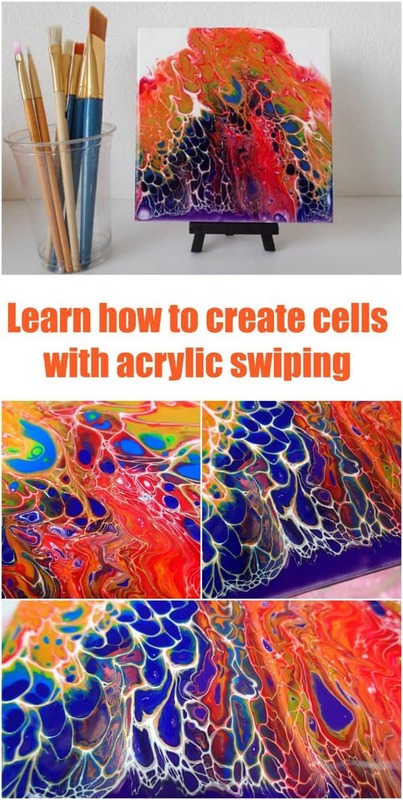 Does those cells come up becquse you paint over tile or because you add silicone to the paint! 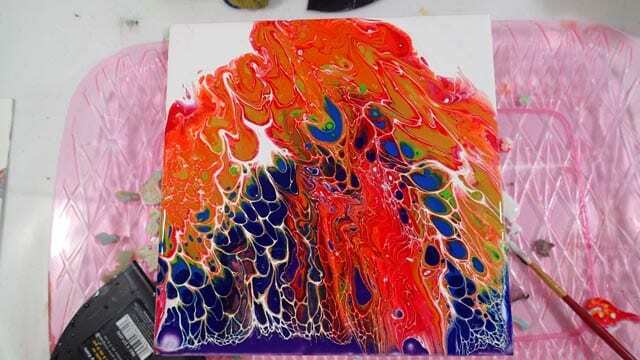 It’s a combination of the paints mixing and the silicone oil adds to that. 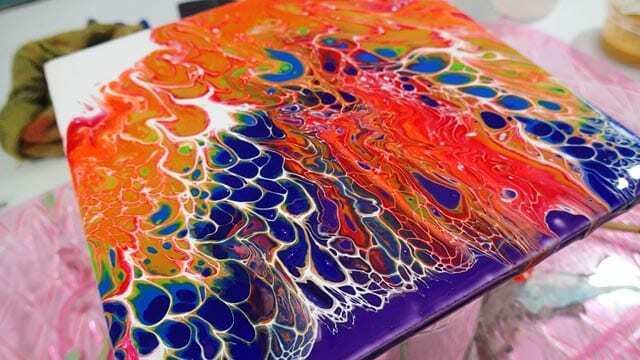 Not to do with the tile, the same thing happens on a canvas too. I’m not understanding what creates cells. Is the top coat the one with the silicone in it? 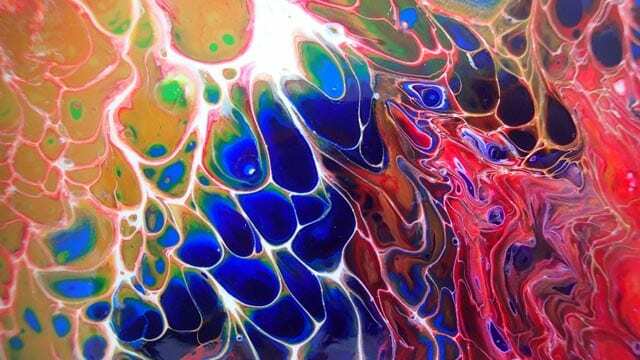 What really creates the cells is the way the paints react with each other as one goes over the top of another. 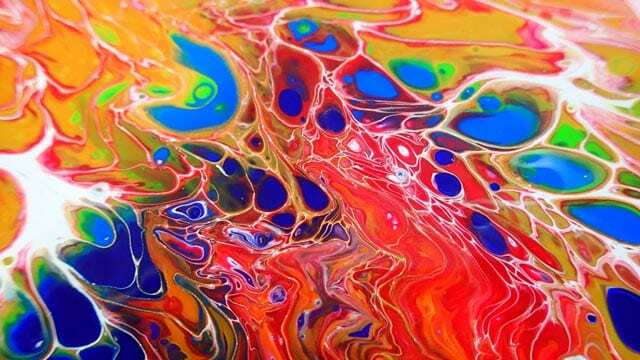 Differing densities of paint fall or rise in the blend causing the cells. You can encourage this to happen by making them move more with the addition of an additive such as silicone oils. Hi there, when you say silicone oil, do you mean just regular silicon for bathtubs etc or is there a specific type that you buy from a craft store. Also how much do you usually add? Just a squirt or a lot? And you have to experiment to see how much to add. It can be about 1 drop per 2-3 oz of paint or so. Some people use more. It all depends on what works for your paints. ¿POR QUE LES QUEDA BRILLANTE? CUAL ES EL PRODUCTO QUE LE DA ESE BRILLO. The torch has two functions. 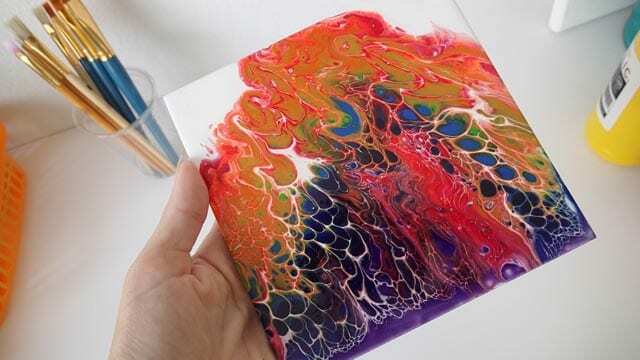 1 – it gently warms the paint and causes any air bubbles to rise to the surface and pop so you get a cleaner finish once the paint has dried 2 – at the same time it also gently heats the silicone causing that to rise through as well and help to create the cells in the paint. 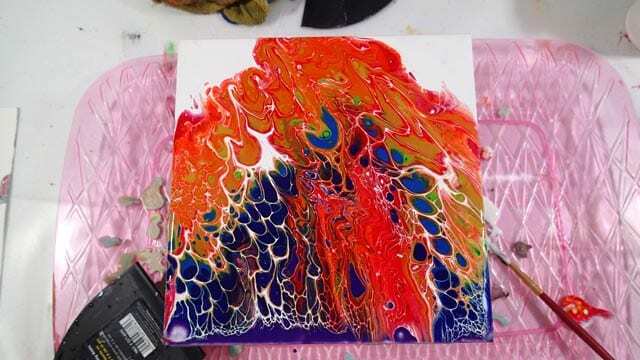 What is your recipe for the pouring medium & paint? 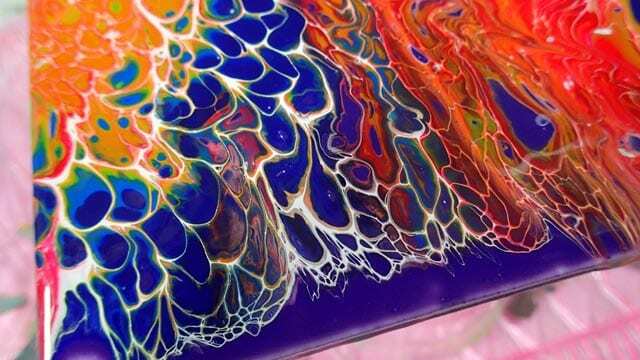 Do you use Liquitex? My recipe for this painting: 1 tbsp paint, 1/2 tbsp floetrol, about 1 tsp water, couple of drops of oil per color. No I don’t use Liquitex often, its very expensive here. Have you ever done an oven cured of a pour on tile? No. I’m concerned about possible release of fumes into the house and the oven. Plus its not the sort of thing I would be comfortable recommending to others unless I could know it was completely safe. I’ve heard some people do it outside in a toaster oven they use just for crafts. Yes you can. There are several painters who do. But be aware that some of them blow hot air rather than just heat and can move your paint about more than you would like. A torch is the preferred method for me.